Oour eyes are one of the most important sensory organs as our brain interprets and retains most information and memory through them. Thus, it is important to take care of our eyes and develop good eye care habits. One of the most common eye conditions that affects children is myopia, or short-sightedness, where a child can see near objects clearly but distant objects appear blurred. This begins and progresses during childhood. 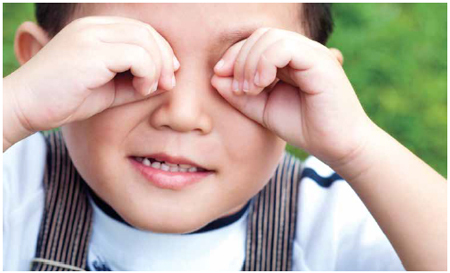 The prevalence of myopia in Singaporean children is one of the highest worldwide, and it has increased significantly over the past two decades. It is found that poor eye care habits are highly associated with myopia. Long hours in front of computer screens and television, reading materials held very near the eyes and insufficient lighting are some examples of poor eye care habits. An excellent therapeutic choice for children’s eyes is paediatric massage. A non-invasive procedure on selected acupoints, especially those around the eyes, this massage improves blood and energy flow and strengthens surrounding eye muscles. Regular massage can prevent myopia in normal kids, and it slows down the deterioration process in toddlers who have hereditary bad vision. Besides paediatric massage, parents should also encourage their children to practise good eye care habits such as taking breaks in between long durations of reading and watching television to avoid overworking their eyes. Having a well-balanced diet rich in vitamins (A, B1, B2, C and E) is also vital in maintaining good eye health.